The Spanish Pyrenees offer excellent Off-Road facilities, catering special for the novices and middle levels of experience. 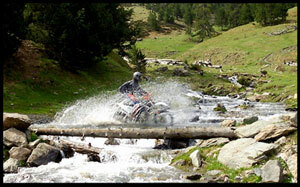 Come the month of May the sun melts the snow from the mountain routes and we start with our Off-Road season. We use Husqvarna's FE 350 and FE450, special prepared for Off-Road motorcycling. Your jovial hosts are Marian van de Wal and Bas de Groot. The tours will lead you through unspoiled natural surroundings with superb Panoramic views. Along muddy, dusty and stony trails, through small rivers, climbing to the “Roof of the Pyrenees” at 3000 m. During the routes we will stop several times to enjoy the magnificent scenery and to make pictures. We leave at 9.30 o’clock in the morning and we will be back in the hotel between 18.00 and 19.00 o’clock. For Motorcyclists with little experience a Training Course is included free of charge. One of our Off-Road trip includes a White Water Adventure. A spectacular 12 km. trip down the river the Noguera-Pallaresa. At the end of the week a mountain barbecue will be organized. Family or friends staying in the hotel will be welcome to join the barbecue. 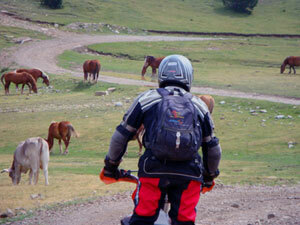 The Pyrenees also offer great opportunities for Motorcycling on Road. 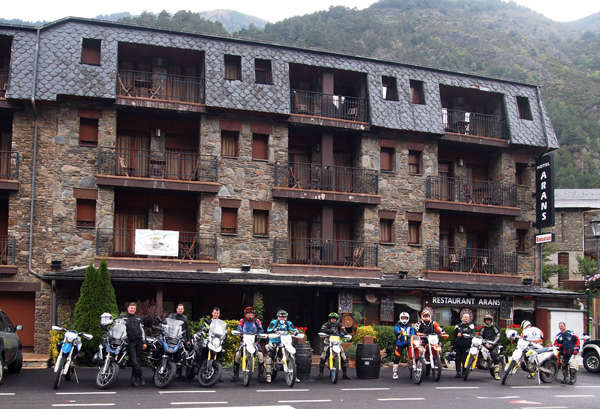 For tourist Motorcyclists in transit through Andorra there is always a warm Welcome in our Hotel.